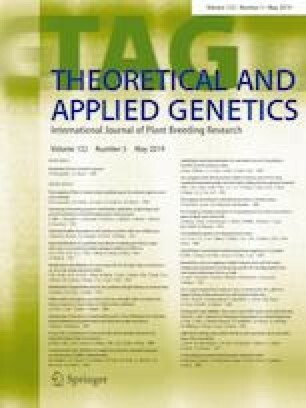 A combinatorial genomic strategy delineated functionally relevant natural allele of a CLAVATA gene and its marker (haplotype)-assisted introgression led to development of the early-flowering chickpea cultivars with high flower number and enhanced yield/productivity. Unraveling the genetic components involved in CLAVATA (CLV) signaling is crucial for modulating important shoot apical meristem (SAM) characteristics and ultimately regulating diverse SAM-regulated agromorphological traits in crop plants. A genome-wide scan identified 142 CLV1-, 28 CLV2- and 6 CLV3-like genes, and their comprehensive genomic constitution and phylogenetic relationships were deciphered in chickpea. The QTL/fine mapping and map-based cloning integrated with high-resolution association analysis identified SNP loci from CaCLV3_01 gene within a major CaqDTF1.1/CaqFN1.1 QTL associated with DTF (days to 50% flowering) and FN (flower number) traits in chickpea, which was further ascertained by quantitative expression profiling. Molecular haplotyping of CaCLV3_01 gene, expressed specifically in SAM, constituted two major haplotypes that differentiated the early-DTF and high-FN chickpea accessions from late-DTF and low-FN. Enhanced accumulation of transcripts of superior CaCLV3_01 gene haplotype and known flowering promoting genes was observed in the corresponding haplotype-introgressed early-DTF and high-FN near-isogenic lines (NILs) with narrow SAM width. The superior haplotype-introgressed NILs exhibited early-flowering, high-FN and enhanced seed yield/productivity without compromising agronomic performance. These delineated molecular signatures can regulate DTF and FN traits through SAM proliferation and differentiation and thereby will be useful for translational genomic study to develop early-flowering cultivars with enhanced yield/productivity. The online version of this article ( https://doi.org/10.1007/s00122-019-03335-y) contains supplementary material, which is available to authorized users. The financial support provided by (Grant No. 102/IFD/SAN/2161/2013-14) the Department of Biotechnology (DBT), Ministry of Science and Technology, Government of India, is acknowledged. UB, LN and VT acknowledge the UGC (University Grants Commission) and DBT for Senior/Junior Research Fellowship awards.